Joining the Agile Development Task Force speaks to Scaled Agile’s dedication to ensuring that our certification program continues to lead through constant improvement. 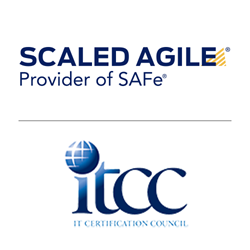 Scaled Agile, Inc., provider of SAFe®, the world’s leading framework for enterprise agility, today announced that company certification team members have been invited to join the Agile Development Task Force of the IT Certification Council (ITCC). The ITCC is a council of IT industry leaders focused on promoting IT certifications and committed to growing professional certifications, while recognizing the need for a qualified workforce to support the world’s technology needs. As Agile software development practices advance to address today’s ever-changing software demands, the Agile Development Task Force helps ensure that tests and certifications are reliable, valid, and fair. Members of Scaled Agile’s certification program team joined the Task Force to share their experience, promote the value of IT certification, ensure that hard-earned credentials are protected, and help define policies for certification. Scaled Agile is the certifying body of the Scaled Agile Framework® (SAFe®). Its Professional Certification Program provides a valid, reliable, and consistent method of assessing SAFe skills, knowledge, and mindset. Certified SAFe professionals are globally recognized for their ability to successfully enable and transform organizations into Lean-Agile enterprises. Participating members of the ITCC share expertise and contribute to one of ITCC’s many industry task forces that influence global IT certification policies. The ITCC serves as a resource for employers, government officials, academia, and individuals seeking information about the benefits of IT certification by establishing industry best practices, marketing the value of certification, enhancing exam security, and working on other certification issues. For more information on the ITCC, please visit itcertcouncil.org. Scaled Agile, Inc., is the provider of SAFe®, the world’s leading framework for enterprise agility. Through learning and certification, a global partner network, and a growing community of over 250,000 trained professionals, Scaled Agile helps enterprises build better systems, increase employee engagement, and improve business outcomes. Scaled Agile is a contributing member of the Pledge 1% corporate philanthropy and community service movement. Learn about Scaled Agile and SAFe at scaledagile.com and scaledagileframework.com.